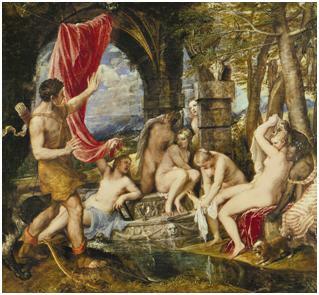 The National Gallery is exhibiting three of Titians most famous paintings from his Metamorphosis series, as well as reactions to it by contemporary artists, poets and choreographers, as part of the Cultural Olympiad, a “summer”-long festival in the UK celebrating Britain’s cultural landscape. Nowhere does it say that the events, acts, performances and exhibitions of this Cultural Olympiad are for British self-promotion, but with a bouncy castle Stonehenge and 37 Shakespeare plays performed in 37 languages, not to mention the patriotic opening ceremony, you have to assume that promoting Britain and her diverse cultural landscape is indeed the aim of the Games. I was surprised, then, to see that Titian was chosen to feature in this cultural festival, given his tenuous, if at all visible, link to British art history or the Olympics themselves. I would even be willing to eat my own words and suggest that even Turner would have been a better candidate. Yes, Titian was an inspirational and iconic painter, whose legacy lives on nearly half a millennia after his death and whose use of colour changed the course of art forever, but he’s still an Italian Renaissance painter who has been dead for 435 years. 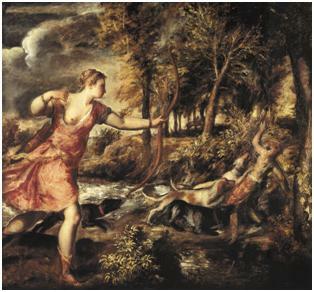 Titian (Tiziano Vecellio), Diana and Actaeon, 1556-1559. Oil on canvas, 184.5 x 202.2 cm. Titian (Tiziano Vecellio), The Death of Actaeon, c. 1565-1576. Oil on canvas, 178.4 x 198.1 cm. Whatever the justification for its being featured, Titian’s Metamorphosis series hangs alongside pieces it has inspired from contemporary artists, in order to show Britain’s multi-layered cultural presence in the world and its ability to draw inspiration from many sources past and present to create something wonderful and novel. But I fear that the aim of this exhibition may well backfire, as these contemporary artists will constantly be compared to some of the most famous paintings by one of the most revered artists of all time. I can’t help but feel that instead of celebrating British high-culture and interest in the arts, this exhibition has wound up paying homage to a great master, whose involvement in the cultural landscape of Britain has been less notable than others. Wrong time, wrong place, National Gallery – could it be that they are trying to get their money’s worth out of their £95 million investment? You can see these three Titian paintings (Diana and Actaeon, The Death of Actaeon and Diana and Callisto) together for the first time since the 18th century at the National Gallery, London. The exhibition Metamorphosis: Titian 2012 will be around until 23 September 2012, or you can get this Titian book featuring many more of his masterpieces. Previous Entry Jean Paul Gaultier: Von wegen Mode und Parfüm sei nur was für Frauen! Next Entry Titien et la gloire de la culture anglaise ?